Did you get a paycheck this week? If you did, quite likely your employer withheld money from it to cover your obligation to pay state income taxes. Sorry, but you are part of the group that funds state government. Do you draw your income from selling things, renting houses, farming, or some other type of business venture? Congratulations! You don’t owe any state income tax. Enjoy the money. It would be great if you used it to create a job, but you have no obligation to do so. For the last 3 years, income tax policy in Kansas has roughly divided the citizenry into the paycheck people who pay and others who don’t. It’s fundamentally unfair. Put in place by the 2012 Legislature, the policy completely exempts individuals who receive business income from any state income tax liability. No other state requires the paycheck people to pay but entirely exempts business income. Much of the public discussion of this policy has focused on limited liability corporations (LLC’s). Setting up an LLC is relatively easy. These can be tiny entities or great big businesses, but little or big, the profit individuals make through their LLCs is exempt from Kansas income tax. However, the policy goes much further than that. Any individual reporting income as business income rather than a wage, or receiving rental income or farm income, is also exempt. In Kansas, more than 300,000 tax filers took advantage of the exemption in the first year. This creates all sorts of unfair situations. A lawyer who owns his or her own office does not pay state income tax, but everyone else working in the office does. A farmer does not pay, a factory worker does. A self-employed doctor does not pay, a doctor working for a hospital does. A landlord does not pay, a renter does. A writer working on contract does not pay, a newspaper reporter does. A food truck vender does not pay, a food service worker does. The policy was ostensibly put in place to create jobs, but those receiving the tax break were given no requirement to do so. They could just as easily bank the money or spend it on out-of-state travel. As a result, the policy has not produced the intended effect. In the years it has been in place, Kansas job creation has been anemic, running behind both the geographic region and the U.S. average. Legislators made a run at modifying the policy in the last legislative session, but Gov. 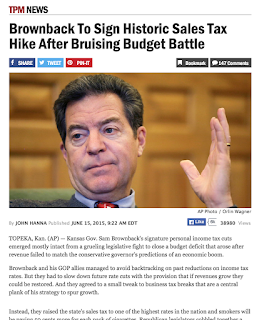 Brownback stopped them in their tracks by threatening to veto any change. So unfairness persists. In June, lawmakers raised the sales tax rate and moved money from the state’s highway fund to narrowly avert a full-blown budget crisis, caused by the income tax changes. However, even after shifting to the much more regressive sales tax, Kansas is still just barely sliding by financially. Each month revenue collections are falling behind expectations, putting even a conservative set of school expenditures and other programs at risk. Tax policy will need to be revisited. Few of us like to pay taxes. If you have benefited from the business income exemption—nice. If you are a wage earner with a paycheck—tough. And you are right. It’s not fair. Kansas school districts face a multi-year decline in classroom funding while statewide enrollment grows, and while costs for supplies, utilities, student transportation, and salaries rise. An important accounting of this trend can be found in the table “Major Categories of State Aid for K-12 Education in Kansas” in the FY 2016 Comparison Report (page 60). The table contains the governor’s numbers, reported by his Kansas Division of the Budget. The budget office uses FY 2011 as the comparison point to the current fiscal year, but if the FY 2016 numbers were compared to FY 2009, the trend would actually be even starker. The chart below, reprinted from the previous blog post on this topic, summarizes the numbers from the Comparison Report table. The switch to block grant funding serves to hide the trend. 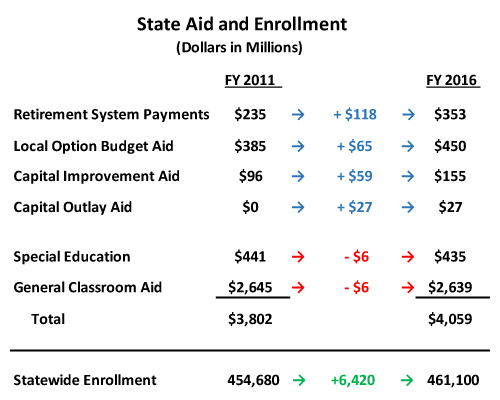 In the Comparison Report table’s FY 2011 column, it’s easy to see the numbers separated out for General State Aid (classroom dollars) and for special purposes such as Retirement System Payments (KPERS), Local Option Budget Aid, etc., but in the FY 2016 column most of those categories are mushed together under the block grant. However, an earlier table on page 59 shows how to unpack the block grant numbers to gain a clear comparison between the years. Statewide mill levy money is included in the comparison. For many years, Kansas has had a 20-mill statewide levy for schools. The property tax proceeds from that levy used to go directly to school districts, but in FY 2015 the state began routing the money through the state treasury and counting it as state aid. The block grant incorporates that statewide mill levy money. For the purpose of comparing FY 2011 to FY 2016 the table correctly includes that property tax funding in both years, even though it did not pass through the state treasury in FY 2011. Federal recovery act (ARRA) dollars are appropriately counted as “state aid” in FY 2011. In FY 2010 and FY 2011 all states received federal ARRA funding to support Medicaid and Education as part of the federal government’s attempt to help states through the Great Recession. Kansas lawmakers chose to use the federal education dollars as a substitute for state general fund dollars, knowing that the federal money was only available for two years. To school districts it was all “state aid,” whether the source was ARRA funds or the general fund, just as the Comparison Report table appropriately shows. School districts expected that lawmakers would shift the source of school finance funding back to the SGF when the state no longer had access to ARRA funds. School districts also garner funding through local property tax levies for local option budgets, and bond issues. While the Comparison Report table does not show those sources, it does show the portion of school finance for which state lawmakers are responsible. 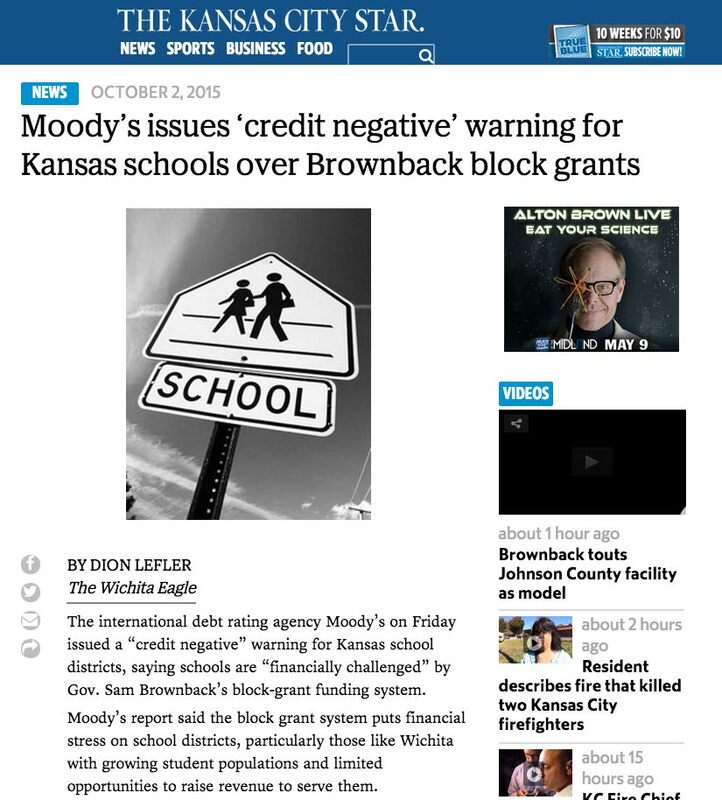 School block grants are a direct result of the state’s financial crisis. With revenue dropping as a consequence of unaffordable tax cuts, the switch to block grants provided a way to shut off increases for schools. Yes, as the chart shows, the amount for KPERS, capital improvement aid (buildings), capital outlay aid, and local option budget aid (mostly property tax relief) has grown. But the remaining state aid — the money that is used for classrooms — has declined. If Kansas lawmakers want more money to go to classrooms, they should put more money there. The current block grant setup does not accomplish that.